The military has rolled into Uber for the October/November round, with this challenging theme The Loft has created the Roxanne dining table set, a predominantly industrial style set with a generous nod to mid century modern style. The Roxanne table is the feature of this set, with up-cycled industrial legs and a clean finished wood top it is sure to be a conversation starter. The chairs are a perfect compliment, in a mid century style with clean lines, available in 11 different colours. Also available is a ceiling light fixture, faux hide rug, wall art, and decorative vases. Each item is sold separately. The Roxanne table, chairs, and vases come with texture change options, and the light fixture turns on and off on touch. 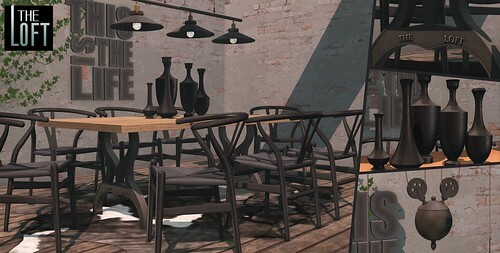 The chairs come loaded with animations for dining, desk, and general use, some include auto rezzing and wearable props. The Roxanne Dining set totals 32 land impact as displayed, and all items are copy and modifiable. Collabor88 is back this month with “Sounds of the Forest” as the theme. For this nature inspired theme The Loft has created a dining set combining traditional modern and industrial style with natural elements. The stone topped table is the feature of this set with a break down the center filled with succulents and stone candles. Traditional styled rattan chairs are available in 4 different colours each sold separately. Also available are hexagonal lanterns in 3 metal variations each sold separate. Each chair is packed with singles poses some which include auto attach and rezzable props. The candles on the table and in the lanterns turn on and off when clicked. The complete set is 32 land impact as displayed, and copy and modify. THe Hellam Dining set, a set sure to make a statement on your patio. Perfect for any garden, urban rooftop, or backyard pool. This uniquely styled set comes with table, benches, chandelier. and table runner, as well as matching succulent bowl and decorative tea lights. The Hellam Dining bench and table runner come with texture change options to create your own personal look. The bench comes loaded with hand picked animations, attachable props and seats up to three. The chandelier turns on and off on touch. The Hellam dining set is 47 land impact as seen on display, each item is copy modify. See this set at Collabor88. 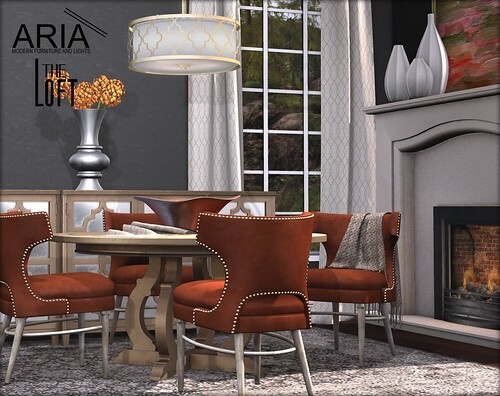 For this round of Uber – Pumpkin Spice (Starts October 25th), ARIA and The Loft ring you an elegant, cozy and warm dining room suite. The Ambrose dining suite includes all you may want in a dining room and more; a dining table that comes in three spectacular texture variations as well as a matching sideboard. 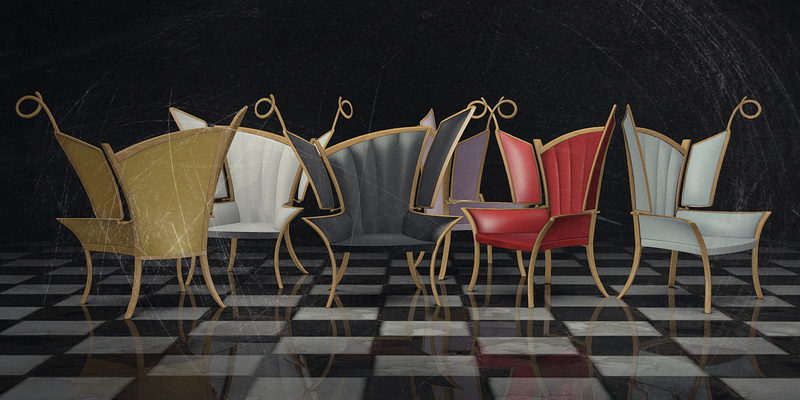 Dining chairs in ten texture variations with each one including 3 wood textures for the legs and 3 for the rivets scripted into them with a texture change script. 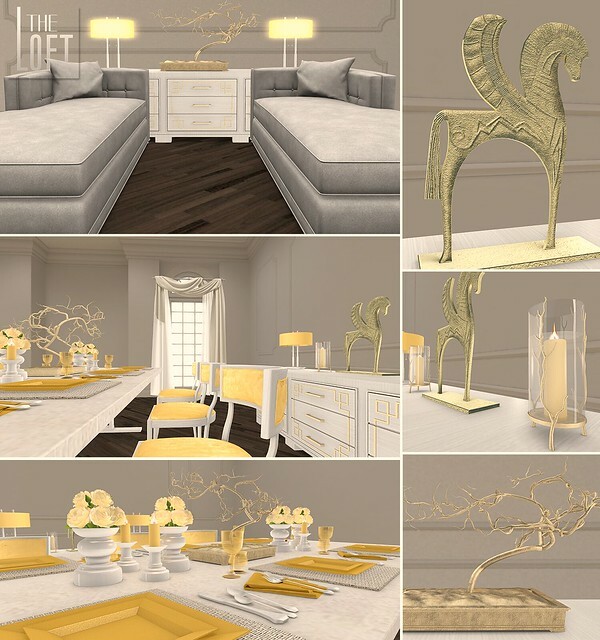 It also comes with a stylish fireplace and lots of accessories to compliment everything, including a center piece bowl, a vase with Hydrangeas (5 textures scripted into it for the flowers), a curtain and a picture frame which also include 3 options for the metal type scripted into them, a pendant light, vases trio, a faded rug and a warm decorative throw. 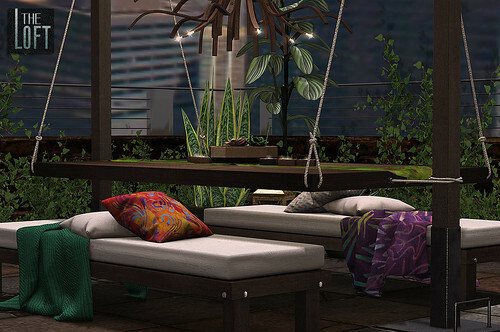 For the upcoming round of Collabor88 themed Burtonesque, The Loft and ARIA present you with the Baxter dining suite and extension of our previously released Baxter Bathroom Suite. It includes a luxurious dining table, dining chairs with texture changeable trim, sideboard, chandelier, rug, place setting and a center piece. All of this is accompanied by some quirky accessories. Casual Beach Dining for you and 5 of your besties. Seats 6, each cushion contains animations and automatically attaching props. 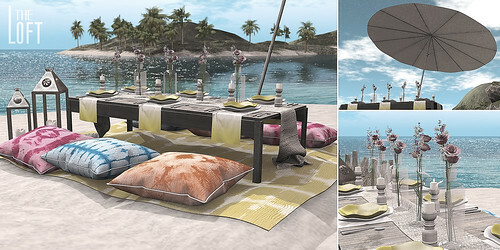 Comes with blanket on sand, we have also included the shadow map so you can overlay your own sand texture for blending on your land or even grass textures and turn it into causal garden dining.